The house was built in the seventeenth century by the influential Braithwaite family of Ambleside Hall, to access their lands on the other side of Stock Beck and also to store apples from their orchards, which surrounded Bridge House. Built with a door at both ends so that it could still be used as a covered bridge and as a summerhouse. 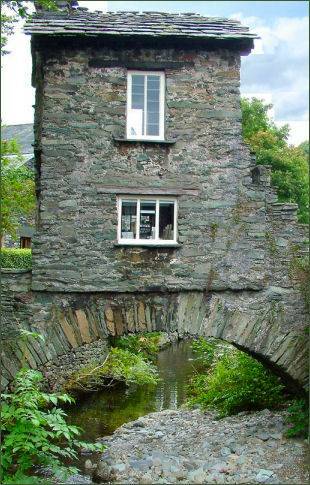 Later in the eighteenth century, when two water-driven mills stood alongside the beck, it was used as a counting house, as shown by the holes on the internal window sills and lintels where iron bars were once situated. Basically a one up, one down dwelling, over the proceeding centuries it has been put to various uses including a weaving shop, a cobbler's, a chair maker's, an antique shop and at one time it even housed a family of eight. In 1805 the building was used as a tea-room. 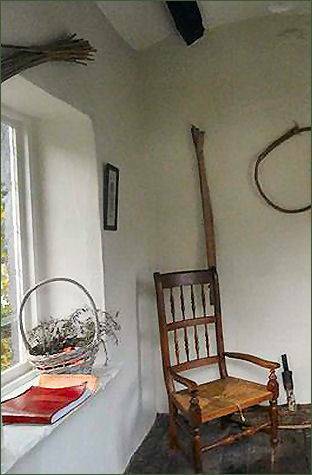 A nineteenth century census records that it was occupied by a rush seat and basket weaver named John 'Chairy' Rigg and his family of six children. In 1905 a cobbler was mending shoes downstairs and keeping his pigeons upstairs. In 1926 a group of local people, including the wife of National Trust founder Canon Rawnsley and William Wordsworth's grandson, raised funds to purchase the building it was then given into the care of the National Trust. It was formerly used as the National Trust's first information and recruitment centre, and now serves as a National Trust shop.